A nugget of anthracite coal. From Middle English cole, from Old English col, from Proto-Germanic *kulą (compare West Frisian koal, Dutch kool, German Kohle, Danish kul), from Proto-Indo-European *gʷol- (compare Old Irish gúal (“coal”), Tocharian B śoliye (“hearth”), Persian زغال‎ (zoġāl, “live coal”)), from *ǵwelH- (“to glow, burn”) (compare Lithuanian žvìlti (“to twinkle, glow”), Sanskrit ज्वलति (jvalati, “to burn, glow”)). (uncountable) A black rock formed from prehistoric plant remains, composed largely of carbon and burned as a fuel. 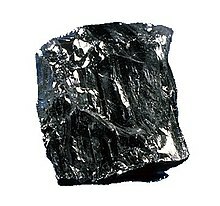 (countable) A piece of coal used for burning. Note that in British English either of the following examples could be used, whereas the latter would be more common in American English. Put some coals on the fire. Put some coal on the fire. (countable) A type of coal, such as bituminous, anthracite, or lignite, and grades and varieties thereof. (countable) A glowing or charred piece of coal, wood, or other solid fuel. Just as the camp-fire died down to just coals, with no flames to burn the marshmallows, someone dumped a whole load of wood on, so I gave up and went to bed. (intransitive) To take on a supply of coal (usually of steam ships). The light shook and splintered in the puddles. A red glare came from an outward-bound steamer that was coaling. shortly after that she coaled again at Simon's Bay; and that after remaining in the neighbourhood of our ports for a time, she proceeded to Mauritius, where she coaled again, and then returned to this colony. (transitive) To supply with coal. (intransitive) To be converted to charcoal. After the initial burn the goal of any good fire should be coaling; that is, creating a bed of solid coals that will sustain the fire. As a result, particles of wood and twigs insufficiently coaled are frequently found at the bottom of such pits. Char-coal of roots, coaled into great pieces. coal in Webster’s Revised Unabridged Dictionary, G. & C. Merriam, 1913.